Today’s TBT Cookbook Review form 2014 will give you a heads up on the coming season of fruit. You can use this book for months, months of fruit pleasure. Sherri Brook Vinton is an expert in two things: preserving foods in wonderful recipes and showing you had to do it yourself at home. She knows the complex chemistry of preserving, for sure, but has this grace to communicate how to successfully preserve at home — and her communication will undo that confusion or intimidation we all feel about “making jam at home.” It’s a talent she first showed four years ago in Put ‘em Up! Last year, her second book, Put ‘em Up! Fruit, was published and it is equally superb. I got my copy of Fruit late in the fall, so I’ve held off recommending it until the late spring and summer bounty of fruits became available. Fresh fruit is the starting point Sherri deeply recommends. So, a visit to your local farmers stand is the best way to start using Fruit. Sherri tackles those excuses head on. And, her book deals with the biggest reason we have abandoned doing things ourselves: the quality of the books that have been available to us. 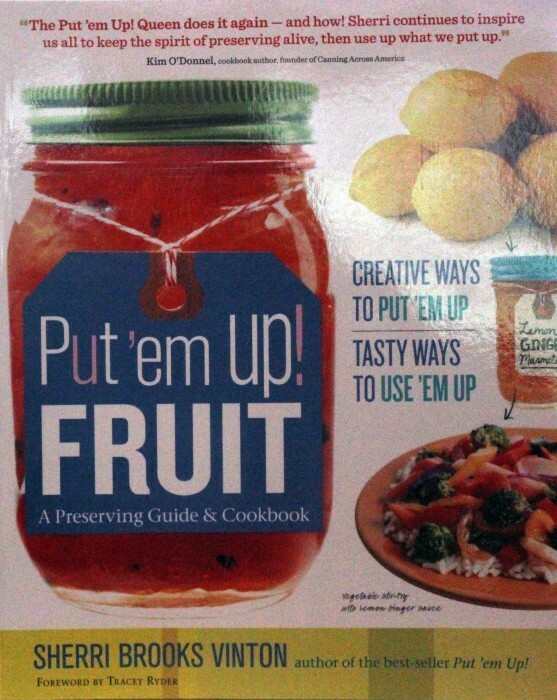 There’s been a round of jam making books in the past few years. Suzen and I have tried them. And we’ve usually failed. Our jams turned out to be like mortar. All we knew was that somehow, even following supposedly good instruction, we had way overcooked. Sherri solves that problem with a short but very detailed guide to reaching the gel state you need to reach and stop at. With farmers markets open, and armed with Fruit, Suzen and I will be in jam making mode again. Fruit is divided into two parts: Getting Started and Recipes. The forty pages of Getting Started are, alone, a reason to buy the book. Confused about those text-only descriptions of making jam and sterilizing jars and being oh so careful along the way? Sherri has a 15 step program complete with pictures at each stage. Easily described and easily followed, the mysteries are now vanished. There is a strong section here on troubleshooting — did your fruit float to the top — so that you can assess your final results and make adjustments the next time out. Sherri would be the first to say that home preserving is not “automatic” but if you follow her guidance, you’re will be in very good hands. But, what to make? And, after you make it, what do you do with it? Come on, admit it, you have jams you bought years ago on your shelf. Is jam only for toast in the morning?